Today we're excited to spotlight Song For A Whale. Read on for more about Lynne, an guest post, plus an giveaway! Lynne Kelly has always loved reading, but while working as a special education teacher, she fell in love with children's literature all over again. She lives in Houston, Texas, and works as a sign language interpreter while writing books for kids. Her first book, Chained, was a South Asia Book Award Honor and Crystal Kite Award winner. Song for a Whale is her second novel. Find her online at http://lynnekellybooks.com/wordpress [lynnekellybooks.com] and on Twitter at @LynneKelly. 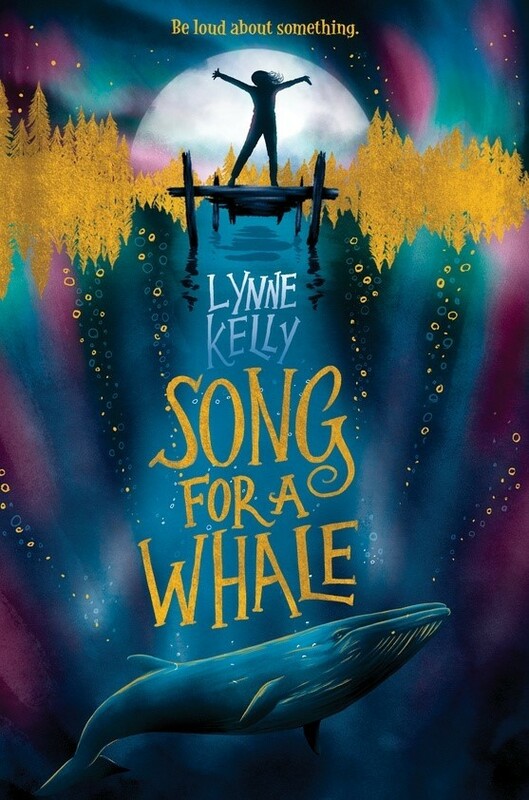 Meet Song For A Whale! Lynne Kelly has always loved reading, and fell in love with children’s literature all over again when she worked as a special education teacher. Her career as a sign language interpreter has taken her everywhere from classrooms to hospitals to Alaskan cruises. She lives near Houston, Texas with her adorable dog, Holly. Song For a Whale is her second novel. Find her online at lynnekellybooks.com and on Twitter @lynnekelly. From fixing the class computer to repairing old radios, twelve-year-old Iris is a tech genius. But she’s the only deaf person in her school, so people often treat her like she’s not very smart. When she learns about Blue 55, a whale who is unable to speak to other whales, Iris understands how he must feel. Then she has an idea: she should invent a way to “sing” to him! But he’s three thousand miles away. How will she play her song for him? And now, Five Fun Facts about sign language! There are approximately 300 signed languages all over the world. Like spoken languages, sign languages are developed by the people who use and share that language, so they emerge and evolve independently of a country’s spoken language. British Sign Language and American Sign Language are quite different, even though the two countries share a common spoken language. Even the signed alphabets are different, with ASL using a one-handed alphabet and BSL a two-handed alphabet. There are also regional differences within a country, like accents! Sign language is three-dimensional. This might seem obvious since signers use the space in front of them to communicate, but there are advantages to 3-D languages. An event like a car crash can be shown concisely, with the hands showing where the cars came from and where they impacted. Many verbs are directional, so I’d sign a phrase like “I give you” with one sign, “give,” moving from me to you. If you’re talking about someone who isn’t here, you can set up an imaginary space next to you that represents that person, and just point to that space to refer to them for the rest of the conversation. Communicating with a signed language uses the same area of the brain as using a spoken language. The parts of the brain that are activated when speaking are near the areas used for hearing sounds and using the vocal chords. It makes sense that the areas used for sight would be active when signing, right? But brain scans comparing deaf and hearing people show that the same areas are activated when communicating, whether using sign language or spoken language. Deaf people who’ve had injuries to these language centers of the brain throws off the grammar of those sign language users. ASL University has courses and a huge online dictionary. Also see the lessons on their excellent YouTube channel. This does sound poignant. --And it's too bad we're killing all the whales with global warming, sonar, and poisons/plastics in the oceans! The whales will be gone, the fish will be gone, the delicious fried shrimp that I love to eat will be gone, just as there are these mass die-offs of insects happening right now. We really are doomed. I love seeing middle grade books having huge releases. I love this cover and I think it will catch the eyes of most students! I love the cover! I am interested in communication, languages and whales. This is a creative book! I love the cover and synopsis. The cover is beautiful! The story seems like something both my daughter and I would love! The cover is stunning. I think I would love this book. I love the gorgeous cover and the synopsis promises a character unlike any other I've ever read about, so it's exciting to me.